All blower motors are UL/CSA Recognized and include automatic-reset thermal overload protection and double-sealed or double-shielded precision ball bearings. Special permanent lubricants perform over a broad temperature range: -20°F (-29°C) to 250°F (121°C). 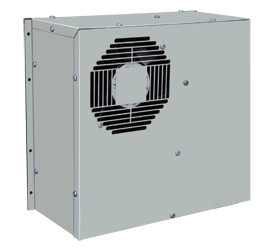 Tube axial fans are rated to perform at 14°F (-10°C) to 158°F (70°C) and are designed to meet UL, CSA and VDE. All models feature a programmable thermostat, allowing more accurate and versatile performance features. A plate or plenum needed to replace older Kooltronic or competitor units. 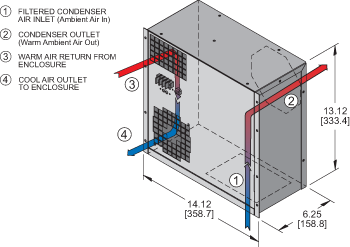 Condensate evaporator kits are available for attachment to the bottom of Air-Cooled Panel Mounted Air Conditioners. Condensate is collected, vaporized and discharged to the surrounding air. All units include a safety overflow drain which discharges excessive condensate when required. Overflow may occur when cabinets are poorly sealed, or when cabinet doors are frequently opened, permitting the invasion of moisture-laden air. An optional feature for models with Programmable Thermostat, Remote Monitoring provides temperature data for warning of early action required.,Accomplished through a Hot Key connection from the Programmable Thermostat to a monitoring system (not supplied) that is ModBus-RTU compatible (i.e. XWEB500/3000/300) via an external 2-position terminal block. For Micro-Mini models the filter part number is 5001F.